Many of us don’t actually stop, think, and break down the word “silverware.” We’re so used to the gray-metallic knives, forks, and spoons in our lives that we don’t ask ourselves the silly questions: why isn’t a type of plastic commonly used for our silverware? Why not a different, cheaper metal than silverware – can’t there be “copperware,” after all? As it turns out, silver is a unique precious metal in that it has some of the great qualities of gold and platinum, but is far more frequently found. This makes it cheaper to buy and sell, and cheaper to use in a common household item like silverware. In this article, we’ll answer some of the above questions and delve into what makes silver such a unique – but abundant – metal. We’ll also answer why it’s the only metal we really trust to put in our mouths on a daily basis. What is silver anyway? And what makes it so different? Silver is the most-frequently found of the precious metals – including gold and platinum – worth more than copper or nickel but not as much as gold. It is an element on the period table, with consistent properties that make its reactions to certain chemicals predictable. Silver is valuable particularly because it has the highest electrical conductivity of any element and the most thermal conductivity of any metal. In fact, silver would probably be used to conduct electricity and transfer power if it weren’t for its relatively expensive price (as opposed to copper). Civilizations have long since known that silver is a valuable metal. Although not as valuable as gold, silver has also seen many similarities to gold – some currencies have been built around the trading of silver. Silver also continues to receive widespread use in jewelry such as watches, as well as other types of ornamentation that are popular. Okay – fine. Silver is valuable and has some unique properties. So why do we put it in our mouths and in our kitchen drawers? Good question. Let’s dig a little deeper. Even early civilizations knew the value of silver as a way to make utensils. But what they might not have realized is that silver is such a relatively safe metal that it actually has anti-septic properties. Bottom line: silver kills germs, bacteria, and fungi – and even better, and avoids killing us because its toxicity is not at the level of other heavy metals. Because of this, silver makes an ideal metal for us to use to touch our food. Even the ancient Phoenicians used silver to store wine, water, and vinegar, helping their drinks to retain their potency without spoiling. Before the development of antibiotics, silver was often used as a disinfectant. Needless to say, silver’s properties have obvious implications in the kitchen. As antibiotics have developed, silver has fallen to the wayside in terms of its medicinal uses, but it continues to make a strong, durable kitchen utensil. Silver is a relatively soft metal that, like gold, can be dented rather easily in its pure form. This is the reason for the “bite test” where you bite down on a piece of gold in order to test its authenticity – if it is soft enough to make a small dent in, you know you’re dealing with a fairly abundant amount of the metal. Because silver is relatively soft, this precious metal will often actually appear in silverware as sterling silver, which is a mixture of silver and other metals that contains at least 92.5% silver. 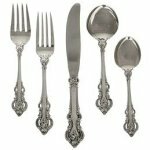 The addition of other metals helps give additional durability and hardness to the silverware. If you have old or broken silverware on your hands, you might have an idea about the silverware’s value without realizing what can be done with it. The answer is clear: you can turn to a trustworthy online metal broker with your silverware. Many of the precious metals (including gold and platinum) will be melted down for industrial re-use. This allows you to make good use of your old silverware. Instead of letting it sit in an abandoned cupboard somewhere, you can put the metal back to industrial use while making a quick profit for yourself. Is the process safe? Yes – you’ll receive an insured mailing package that lets you send your precious metal through the mail easily and without worry. If you’re still not sure, try sending just a small portion of your silverware to give the entire process a “trial run.” You might be pleasantly surprised. Is There a Fool’s Silver?